Who were we Americans, who could absorb the psychological body blow of Soviet Russia putting Sputnik into orbit while we still were blowing our satellites up on the launch pad . . . and then four years later, Yuri Gagarin into orbit before we could get a man into suborbital space at all? 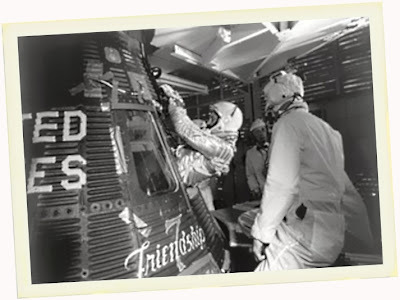 Who was this people who sat by radio and television sets this day 50 years ago, waiting for John Glenn, strapped inside his tiny Mercury capsule, to rocket into orbit atop an Atlas rocket and even the spaceflight score with the communists? What manner of people -- once Glenn had gone up, gone around three times and come down alive and well -- would celebrate his achievement, this affirmation of American greatness, without irony, self-consciousness or reservation? Indeed, what sort of nation would have the audacity to set its sights on placing a man on the moon and returning him to Earth safely in less than a decade's time? Who were we? Who were these people of supreme faith -- in themselves, in God and in their way of life? Who were the people who listened to radio like this on KCBS in San Francisco as early birds on the West Coast awaited history in the late winter's predawn? Who were the people heard in this bit of radio history later that night, along the NBC radio net and over the airwaves of KFAB radio in Omaha as a winter storm roared across the northern Plains? Who were we? What sort folks could maintain such hope and confidence amid the threat of the Cold War going hot and the world being engulfed by a mushroom cloud? Who was this people, the one able to look at the racial horrors of Mississippi, Alabama and across the Deep South, yet keep faith with the better angels of its nature? What sort of man . . . or woman . . . still believed in God, country and heroes? And who in the world listened to sweet music on the airwaves in the chilly predawn? Who still allowed grown-ups and other assorted squares to have a say in the popular culture? I remember these people. I do. I scarcely recognize them anymore, though. I scarcely recognize the nation that gave us Friendship 7 -- and visions of a bright future -- a mere half-century ago. But on the television today, there's an old man, some 90 years of age, a man clearly of a different age -- an anachronism still in this world, yet not of it.